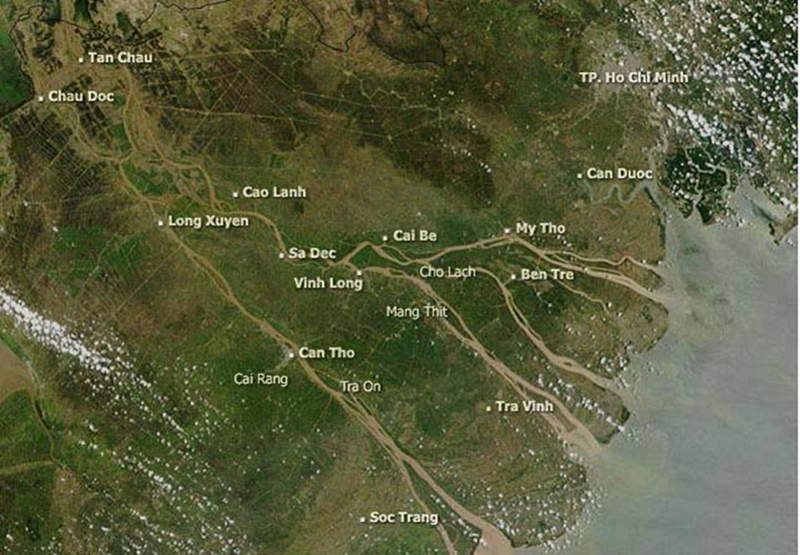 What do you know about Mekong Delta Vietnam? The First River (Tiền Giang), which takes several names on the way, enters at Vĩnh Xương and flows through Tân Châu, Cao Lãnh, Sa Đéc, near Cái Bè and Mỹ Tho before exiting out at sea. We can visit Mekong delta all-year-round. The weather here is pleasant for most of the year. The best time to visit is the dry season, which runs from October to April. But even the rainy season from May to October is no reason not to travel this region, you will still see interesting aspects of the local life. Usually the rain showers are brief and heavy, mostly in the afternoons; but after an hour or so it clears up again. 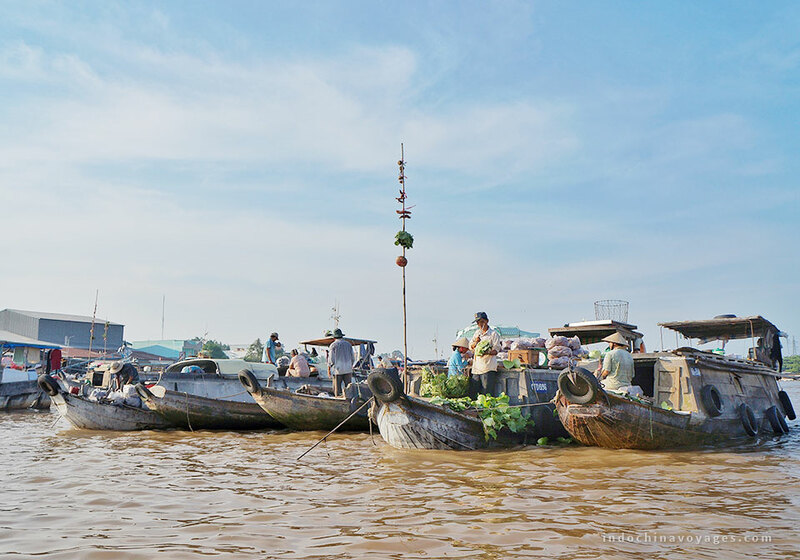 From Septemper to November, it is considered as floating season in Mekong Delta. You will absolutely have wonderful experiences during the journey. It brings many benefits for local people including many maritime products and fertile alluvium. During the floating season, the best place you should visit is Tra Su Cajuput Forest, which is perfect for you to explore wild life of birds. From May to August, Mekong Delta may be hot and humid. 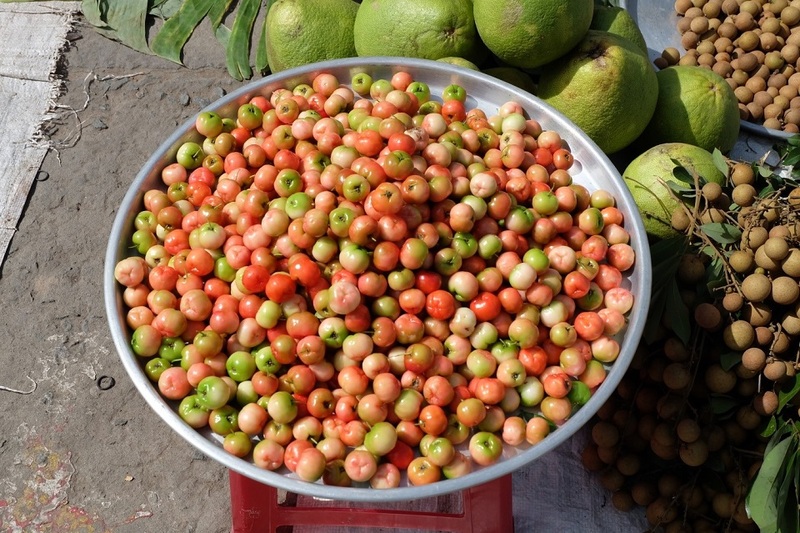 However, it is time for a variety of tropical fruits in Mekong Delta fully grown and ready tobe eaten. Who love fresh tropical fruits can sample and savor amazing fruits such as mango, pineapple, grapefruit, starapple and others. Besides, taking a boat ride under shade of water coconut tree along natural canals; observing local life; enjoying honey tea with the sound of “Southern Vietnamese folk music”; and tasting delicious coconut candy will be your great experiences. 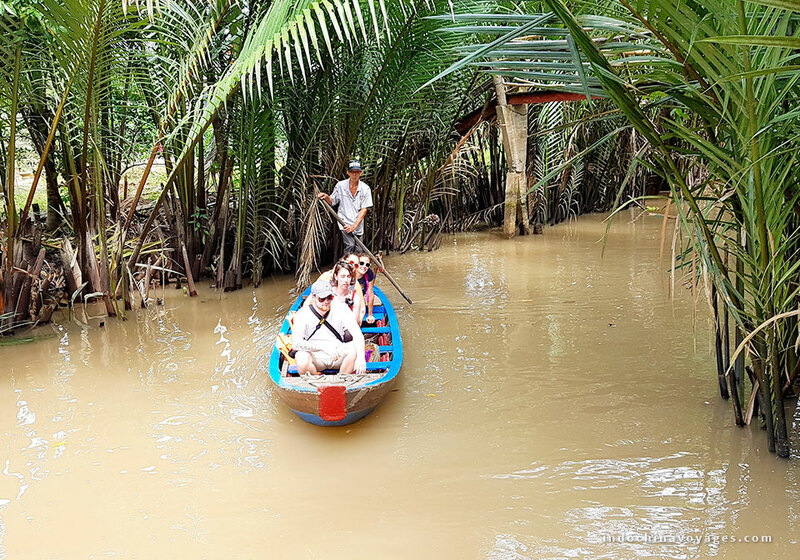 There are various ways to explore the Mekong Delta – overland, on river cruises, local boats or even during the border crossing from Vietnam to Cambodia. Make a trip from Ho Chi Minh city to start Mekong Delta tour will be full of amazing landscapes with unique views of the rice paddies, an exciting preview of what awaits for you. The Mekong Delta is an attractive destination in Vietnam. 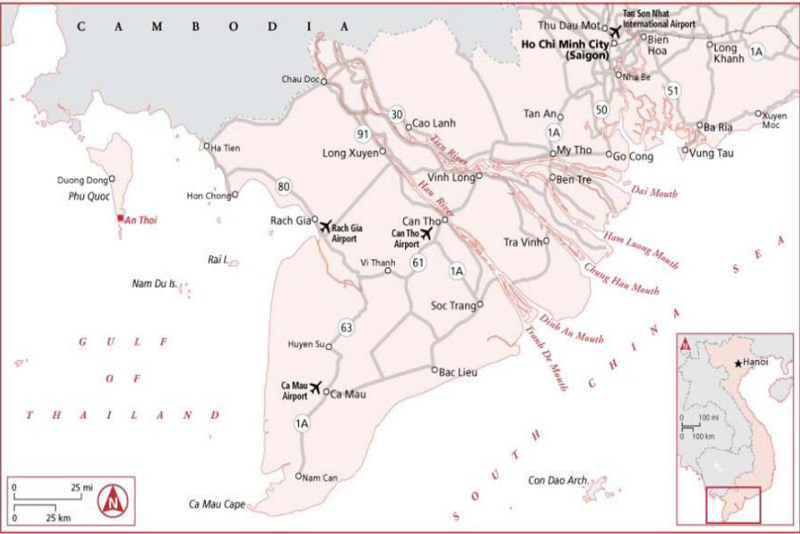 This area includes 12 provinces and one city: An Giang, Bac Lieu, Ben Tre, Ca Mau, Dong Thap, Hau Giang, Kien Giang, Long An, Soc Trang, Tien Giang, Tra Vinh, Vinh Long and Can Tho. And each province has its own highlight such as the four islands in Vinh Long & Ben Tre, floating markets in Tien Giang & Can Tho, flower village in Sa Dec, Ba Chua Xu temple in Chau Doc, Tra Su mangrove forest in An Giang, Phu Quoc island in Kien Giang, and Ca Mau Cape in Ca Mau. A visit to the Mekong Delta is so memorable because of the region’s diversity. Travelling to the Southwest’s orchards, you can enjoy genuine amateur music and succulent tropical fruits in Mekong Delta; such as coconuts, jack fruit, durians and rambutants. The trip is even more fulfilling if we board small boats to reach remote rural hamlets. What can you do in the Mekong Delta? Life in the Mekong Delta is very much lived on, by or near the water. Many visitors spend a day or two in Mekong Delta, normally stop staying overnight in Can Tho city where to take advantage of its decent hotels and restaurants and to recharge batteries before venturing out to the floating markets next early morning. Visiting floating markets is a must. If having more time, exploring in depth Mekong delta for 3 days or stop at Chau Doc town to get speed boat to Phnom Penh, Cambodia or combine couple days relaxing at the beautiful island of Phu Quoc. Experience the floating life: a trip to the Mekong Delta won’t be complete if you see local life in Mekong. Life here is much lived on, by or near the water. Stilt houses built to withstand the rise and fall of the river, entire markets conducted by boat; and people fishing, bathing and washing clothes are everyday scenes in this watery world. You can see vehicles, and food, markets not on land but on boats and instead of walking from stall to stall, you will paddle your way through the river or walk on planks balanced between two boats to buy food. If you like to explore an authentic river life of rural during your Southern Vietnam tour, you can choose staying overnight on sampan/boat to relax and explore Mekong delta on the unique ways. There are many options of boats which you can find below. One day tour from Ho Chi Minh City to Mekong Delta with fruits garden and Cai be floating market is the most popular tour to Mekong Delta. For one-day tour, you can choose to visit My Tho with Vinh Trang pagoda, Bee Farm, Snake Farm, etc. ; and two islands in the Mỹ Tho: Dragon (Cồn Long) and Unicorn (Cồn Lân) Islands or enjoying Đờn ca tài tử (Folk Songs). Most travelers head for My Tho, the closest delta town from Saigon, this place is pretty crowded. To avoid crowds of tourists, another jumping-off point for boat trips is Vinh Long. 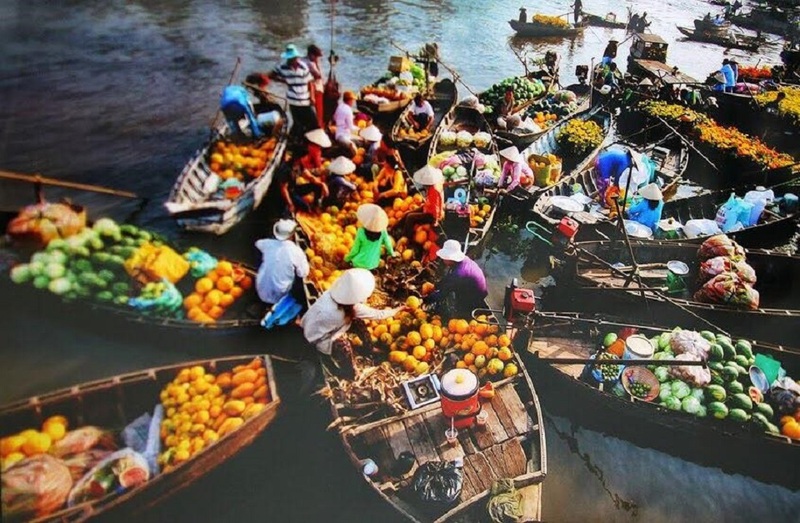 It is where you can visit Cai Be floating market with piles of fruits on bustling clusters of boats and experience overnight home-stays on a cluster of islands. However, if you want to immerse in the bounteous fruit orchards or navigate through rows of coconut palms, laid-back Ben Tre has a more universal appeal. Let’s take advantage of exciting Mekong itinerary 2 days. You can enjoy the area at a much slower pace and discover more of the Delta’s treasures; then fitting in the Cai Rang floating market to your itinerary. The 1st day of your trip will be similar to the 1-day itinerary. But instead of heading back to Ho Chi Minh City, you will continue on from Ben Tre or Can Tho city and find accommodation there to stay for the night. If you do not like stay overland, let explore the fascinating delta aboard sampans/wooden boats; which can be customized just for you – private or join-in, ranging from 2 or 3 days or more. For cruise trip, here is a list for you to consider: Mekong Eyes, Mango Cruises, TransMekong – Bassac Cruise, Le Cochinchine, Caibe Princess & Song Xanh Sampan and cruise trip between Vietnam and Cambodia: Jahan & Jayavarman , Pandaw Cruise, Aqua Mekong. Travelling down to the rivers, visitors can appreciate the region’s interesting past and learn how river life in the South keep evolving.